It’s official. Summer is well and truly on its way, so it’s time to dust off the barbecue and prepare to hot-foot it to the supermarket meat aisle.The sun is out and so thoughts naturally turn to eating – and cooking – al fresco. Don’t just throw a few boring bangers on the barbecue though: a simple marinade can transform even the cheapest cuts of meat, while vegetables like asparagus and peppers are also delicious when grilled. British summers may be a bit of a running joke in terms of the weather, but we Brits certainly know how to make the most of whatever sunny days we are blessed with, and our love of a good barbecue is a prime example. Before and after every session, you should clean and oil your grill. Get it nice and hot to burn off any crud, then, using tongs, rub over with a kitchen towel dipped in a light cooking oil. This keeps your grill hygienic as well as helping prevent food from sticking to the bars. Set up your BBQ so you have two cooking zones, one directly over the flames for searing, the other cooler to allow the meat to cook through indirectly. You can cook anything from sausages and burgers through to whole joints of meat this way. With a charcoal grill, just pile your coals to one side. With a gas grill, keep the burners medium-high on one side and low-off on the other. True BBQ takes time and patience. The meat is done when it’s done – don’t try to rush things. When grilling, learn to control your fire and keep the heat consistent. Keep a spritz bottle full of water handy and douse flames that start getting out of hand. And definitely don’t squeeze. Once you’ve put the meat on the grill, just leave it. You should only turn once or twice through cooking. Squashing burgers and steaks down on the grill just squeezes out all the lovely the juice and causes flare-ups. BBQ sauces and glazes have a high sugar content that will burn very quickly and go bitter. Cook your meat through and then glaze/sauce towards the end and allow to go sticky over indirect heat. Overcooking is as sinful as undercooking. Invest in a good instant read thermometer – so you know the exact temperature of the meat – and take away the guesswork. You’ll always know the chicken is cooked through and you’ll be able to serve up the perfect medium-rare steak. Smoke is a seasoning so learn to add subtle smoke flavour to your food. Wrap woodchips up in a couple of layers of thick foil and pierce a few times before throwing onto the grill over the gas burners. With a charcoal BBQ, just throw the chips straight onto the coals and close the lid. Our favourite woods to smoke with are cherry, pecan and hickory. Meat, and meat alternatives benefit from a generous seasoning prior to cooking. This base rub will work well particularly on pork, quorn or chicken. Use this is a starting point to develop your own, according to the flavours you enjoy. 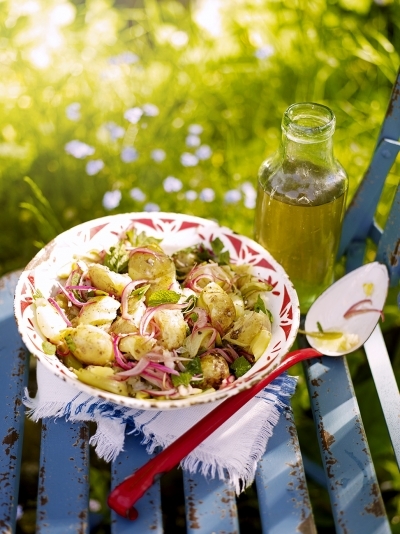 Finally what better to serve BBQ food than a delicious salad, see this recipe below..